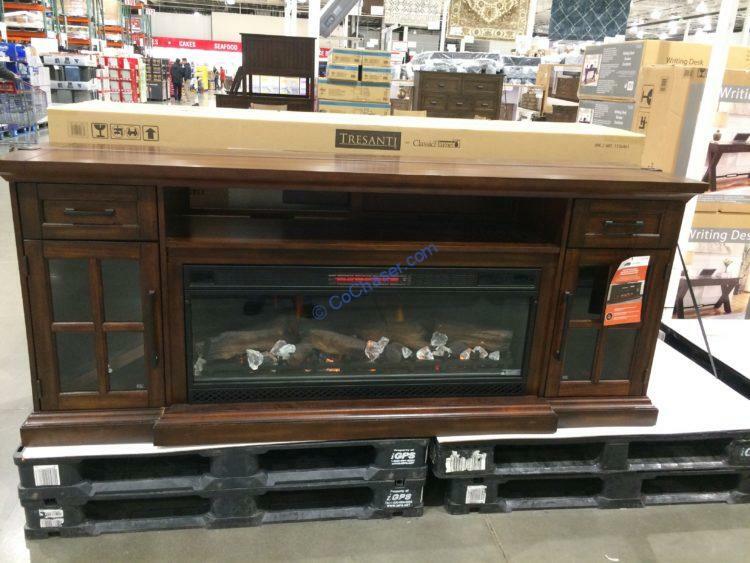 Check out this Tresanti 78″ Fireplace Console at Costco. It features poplar solid wood construction and acacia veneers. For warmth and style in your home, this 78″ TV Stand with Electric Fireplace accommodates TVs up to 80 inches or 155 pounds with ease. Customizable flame effect creates a gentle flickering flame to a roaring fire with the touch of a button. With its rich, Hand Scraped Mahogany finish and Dark Pewter hardware, this stand features a 42-inch infrared quartz electric fireplace for comfortable heat that doesn’t dry out the air as it provides supplemental zone heating. Heats rooms up to 1,000 Sq. Ft.
With 1 drawer and 2 doors, this Electric Fireplace Media Console is designed as a TV console for flat panel TVs.